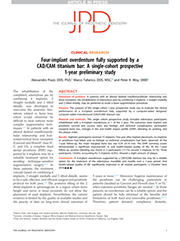 Purpose: To report the up-to-2-year outcomes of the immediately loaded novel variable-thread tapered implant with an internal conical connection and built-in platform shifting. 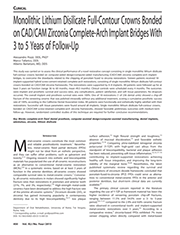 Purpose: This study was carried on to assess the clinical performance of a novel restorative concept consisting in single monolithic lithium disilicate full-contour crowns bonded on computer-aided design/computer-aided manufacturing (CAD/CAM) zirconia complete-arch implant bridges, to overcome the drawbacks related to the chipping of porcelain fused to zirconia restorations. 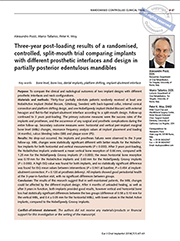 Purpose: The long-term success of machined-surface implants is well documented, whereas the reliability of the moderately rough oxidized implant surface has not been definitively assessed in the long term. 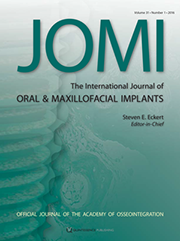 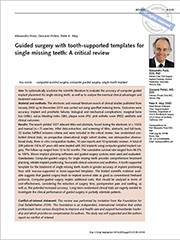 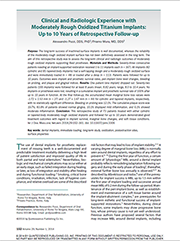 The aim of this retrospective study was to assess the long-term clinical and radiologic outcomes of moderately rough oxidized implants supporting fixed prostheses. 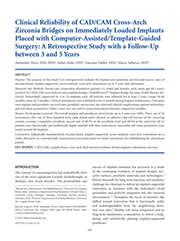 Purpose: To compare the clinical and radiological outcomes of two implant designs with different prosthetic interfaces and neck configurations.